The Penang Bridge costs RM 800 million and took five years to build. Before the bridge was built, transportation between the island and the mainland was solely dependent on the state-owned Penang Ferry Service that runs between Butterworth and George Town. 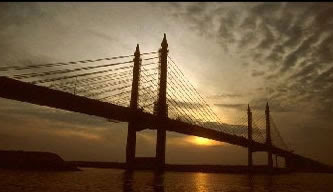 The Penang Bridge connects Gelugor on the island of Penang and Seberang Prai on the mainland of Malaysia on the Malay Peninsula. The total length of the bridge is 13.5 km (8.4 miles), making it among the longest bridges, and since the opening, the Penang Bridge has become an iconic part of George Town, and has contributed significantly to the rapid development of Penang both as a tourist as well as an industrial centre.